Swiss Jura-based watchmaker Edox has a history strewn with triumphs and records (some never equalled to this day) and is adding a string to its bow as the exclusive timekeeper of the Dakar Rally Raid for the next three years. Founded in 1979 by Frenchman Thierry Sabine, the Dakar Rally Raid is incontestably the world’s number one car race and human adventure, every year attracting over 600 participants in the car, truck or motorcycle categories. It was initially staged on the African continent and relocated in 2009 to South America, its route crossing Argentina, Chilli and Peru. The new Edox Limited Edition Dakar watch possesses the brand’s much-prized Values: strength, technicity, a constant drive for perfection. Boasting the attributes of the perfect sporting vehicle, the new Dakar Limited Edition is imbued with the same steel as are the nerves of the Dakar drivers. With its solid 42 mm diameter, the quartz movement is robust, made to withstand extremes of temperature, impacts, sand and earth. The dial faithfully depicts the route of the South American tour. 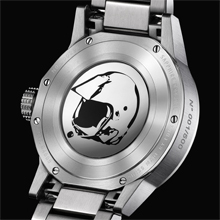 The black back offers perfect visibility, and sets off the white detail of the dial magnific ently. The “Dakar” is a 500-piece limited edition, each piece supplied in an exclusive presentation box. Edox shares the fundamental values of the Dakar Rally: endurance, technicity, a drive for improvement and perfection. Edox is the official timekeeper of the Class 1 World Powerboat Championship and official partner of the FIA World Rally Championship. 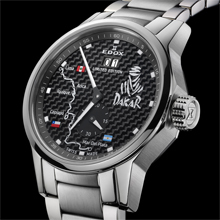 Edox will be the official timekeeper for the Dakar Rally Raid in 2012, 2013 and 2014.